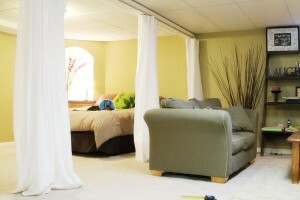 We often get calls from customers looking for solutions to their unfinished basement. They want to install a drop ceiling but the issue they have is dividing a room to create different spaces such as a game room for the kids or a workout room for the adults. The solution we suggest is our 6155 Flexible Curtain Track Drop Ceiling Clamp. This handy dandy item can attach to the drop panel grid support and to a curtain track without any drilling or bracing. These clamps work great with one of our most popular tracks, the 6100 Flexible Curtain Track. The 6100 Flexible Curtain Track can be can custom cut and bent by hand so it perfectly fits your space. It can also be used for straight, curved and angled applications. There’s a reason why it’s so popular. To finish this project, we also suggest our 6111 Flexible Curtain Track Carriers and 6131 Flexible Curtain Track End Caps. Once you have your curtain track hardware installed, simply add curtains. Curtains not only add some warmth and texture to your basement, they also can create a virtual wall to hide a storage area, workout space, or unsightly furnace or sump pump. Not only can they create virtual walls they can even (brace yourself…) be used to cover the windows! The windows in a basement with a drop ceiling may be at the level of the ceiling panels, making hanging a rod impractical. Simply install our track and your favorite decorative curtains, and your unfinished basement doesn’t look so unfinished anymore. Ready to tackle the dreaded basement project? You can order any of these items on our website or simply contact us!